The spiritual successor to Road Rash is due out of Early Access in October. It's already a blast. My memories of the Road Rash games are vague but what I do remember is this: I played them with friends. Even with the PlayStation-exclusive Road Rash 3D, which didn't have split-screen, we'd just pass the controller around and take turns. Whipping people off motorbikes with chains was an after-school group activity. 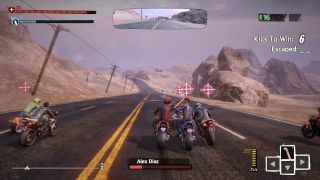 A couple of decades later Road Redemption, a spiritual successor to Road Rash funded via Kickstarter, finds its audience in a very different place. Throughout Early Access it's been adapting to suit modern players. This is still a racing game about pulling up alongside another biker, wailing on them with a pipe, and then being taken out by an oncoming truck because you weren't paying attention, but it's also being called a "rogue-lite" by developers Pixel Dash. The tracks are randomly generated and after crashing too many times you have to start over, an arcade version of permadeath. I don't play Road Redemption like Road Rash. It's easier to think of in terms of runs, like Binding of Isaac or Spelunky. I choose a bike and rider, skip the intro, and dive right into the first race. There are multiple randomly assigned formats, from a straight "place third or better" race to a time trial to a rampage where I have to kill a certain number of members of a gang before they escape. The last one I lose at the most, because somebody always gets away—but rather than being failed back to the menu I just lose a portion of my max health and keep going with my run. What you really want to hear about is the violence though, yeah? Each rider starts with a weapon or two so there's none of that weedy punching the early Road Rash games were full of. Blunt weapons like pipes and wrenches are great for knocking helmets off, and blades are useful for follow-up decapitations, but I'm all about the kick. Honestly, it might be a little overpowered—it's faster than the swing, and you can kick bikes right off bridges or into traffic. I like to attach an explosive to someone, then boot them sideways into another vehicle so the blast takes out both. There are guns too, but aiming at speed is a skill that's beyond me. Fortunately the roads are usually full of cars and trucks as well as bikes, and a spray of SMG fire is bound to clip something. Enemies sometimes shoot back, though they tend to stick to melee. Mostly I die by going off the road or colliding with a car. Each of the three acts is set in a different area and made up of multiple races. The first is all highways, dominated by a gang of Mad Max metalheads called the Reapers whose leader sounds like an orc. At the end of the act there's a boss fight with him, then presumably other opponents in later acts though I'll let you know if I ever make it past this jerk. Dying over and over again would be a bummer, but there's an upgrade system that lets you spend experience points on permanent stuff like slight boosts to health or nitro or unlocking new bikes. A lot of the upgrades are pretty slight and I've never had enough XP to buy more than two at the end of a run, but that feeling of progress takes the sting out of death. There's a decent amount of variety in Road Redemption. Randomized tracks make it impossible to learn layouts in advance and instead I just react to them, staying alert to sudden turns or detours full of power-ups rather than building up muscle memory, even though the tracks are obviously assembled from recognizable pieces like slot car tracks. And sometimes you get a weird one, like the time I got a warning about psychedelics being used in the area and then cars started falling from the sky, smashing into the bitumen as I swerved through a storm of shattering metal. There's an odd stickiness to Road Redemption, with other racers suddenly matching speed to pull alongside you making for clumps that have to be fought through (or boosted past if you've earned a bunch of nitro with Burnout-style recklessness). Although there's four-player splitscreen in Road Redemption it never feels lonely to play by myself, surviving longer each time, pushing further into this wasteland America. It's got a rhythm to it that makes it fit in between other things but also worth concentrating on when I've got time, a ridiculous dream of smashing and crashing that's easy to slot into an adult life in spite of how gleefully juvenile it is. Road Redemption rides out of Early Access on October 4.